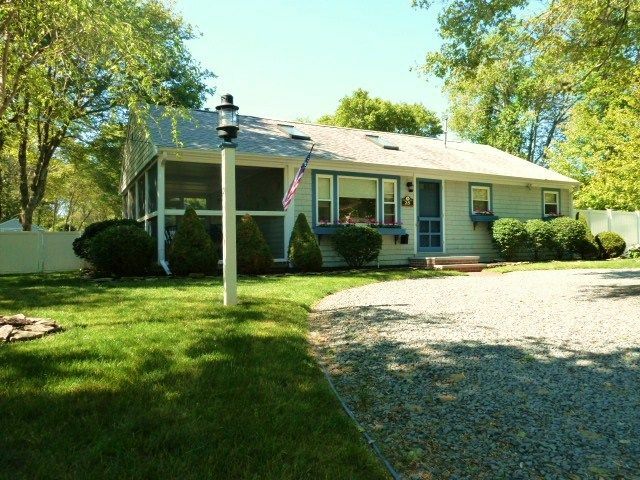 Our Cape Cod home in a quiet, quaint, family neighborhood is the perfect location for your family vacation. The house is equipped with all the comforts of home such as central A/C, wireless Internet access, DVD player, board games, full size washer/dryer, and gas grill. The three bedrooms have been tastefully decorated, and there is a loft with two twin beds. There are several beaches close by, Parkers River Beach a short walk away. Across from Parkers is Skippers, one of our favorite local restaurants with a deck overlooking the beach. An outdoor shower in the back of the house awaits your return from the beach. After that, relax on the patio, in the yard on the hammock, or read a book in the screened in porch. Family Fun Nearby - : Our home is very close to many family oriented attractions such as Skull Island and Pirates Cove miniature golf complexes with driving range and go carts, the Whydah Pirate Museum, Cape Cod Inflatable Park, and several beaches with on site facilities. Dozens of restaurants are also within a few minutes drive. There are plenty of additional Cape Cod activities right at your finger tips including biking, tennis, golfing, shopping/antiquing fishing, and boating. Hyannis is one town over, where you can stroll the shops on Main Street, or take a ferry to Nantucket or Martha's Vineyard for the day. House Grounds: Escape to the quiet and private, fully fenced in backyard, which offers a wonderful combination of sun and shade throughout the entire day. Let the kids play without worrying about them wandering off. The lots in our neighborhood are good sized so there is a secluded feel to the property. There is little to no traffic on our street during the average day. The large screened in porch offers a place to escape the elements, complete with a dining area and wicker furnished sitting area, and still enjoy the fresh cape air. Updates: We continue to make updates to our home as we strive to provide the perfect environment for your Cape vacation. Please note that our summer rentals are Saturday to Saturday, and that linens are not provided but available through local services. After searching many towns and neighborhoods, we knew this house was the one for us. The proximity to the beaches and family friendly activities, along with the modern amenities incorporated into the house and grounds made this an easy choice. Some of the things we appreciate about our home include: Central Air - the ocean breeze can only do so much on those hot nights! Fenced in backyard - a place for kids to play safely. Screened in porch - it's nice to have a place to go where you can enjoy the outdoors/eat a meal and not have to deal with bugs! Location - our street is quiet as is the neighborhood, but we're right in the middle of so much. It's a huge plus to not have to get into the car to enjoy many things the Cape has to offer. We have plenty of dishes and utensils - who wants to be doing dishes all the time? Bluetooth speaker system for living room tv can also stream music from your bluetooth enabled devices. Blue-ray player can also be used to access your Netflix or Amazon Prime content. Plenty of room to stretch out and relax, play games, etc. Our screened in porch includes a full dining area along with wicker furniture to relax on. There is a deck off the back of the house offering an area to dine and relax. The house sits on a corner lot with a large fully fenced in back yard. Great house. Great location. Doug was always easy to contact and responded right away. The house itself was plenty roomy ( had three kids with us-they loved the loft ). Very clean and the yard was great. It was very close to beaches, restaurants and local attractions. Really can't say enough good things about our whole experience. Hope to go back again next year and start building more memories. This house was clean, comfortable and in a great location. Close to the beach, good restaurants and lots to do in the area. The owner was very pleasant to deal with. I hope we can rent here again! Great location and home ! The house is very comfortable, clean, and inviting. Our family had a wonderful stay at Doug's house. It is conveniently located, and the fenced in yard gives one a sense of privacy. Doug was so easy to communicate with, and he made us feel very welcome. I would love to stay here again. We really enjoyed our stay - would love to come back next year! This adorable cottage is a great location and we had a fabulous time! I would definitely book this cottage again. It had everything we needed for a fabulous stay!! The house sits on a corner lot with a large fully fenced in back yard. Our house is a short walk (5-10 minutes) from Parker's River Beach on the Nantucket Sound side of the Cape. There is parking, bathrooms, a gazebo, and swings/etc for the kids. There are 4 other beaches within a 3 minute drive including Bass River Beach which also has plenty of parking, a boat launch, and bathrooms. Bayberry Hills - just under 3 miles from our house. Bass River Golf Course - about 3 miles. Hyannis Golf Club - around 10 miles. There's plenty of others to choose from on cape. If you travel off cape (during the week when traffic is light) there are some of the best courses in Mass around Plymouth - about 15 miles up the highway from the bridge: The Pine Hills, Waverly Oaks, Crosswinds, and Atlantic Golf Course.